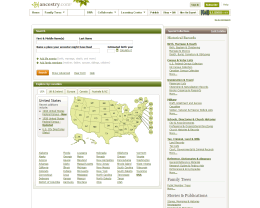 Ancestry.com is one of the largest family search information sites available online. With Ancestry.com, you can trace a family history, search for lost relatives, build a family tree and even find hidden relatives with their DNA testing. Ancestry.com takes all the facts you you know about your family and uses them to search billions of historical records, photos and family trees for missing details about your ancestors. The more you add to your tree, the more they can help you grow it. They can even notify you when they think they've found one of your ancestors in our collections. It is incredibly difficult site for some to navigate even for those seeking simple information. The difficulty is compounded if you are not managing your own DNA information and go through someone who encouraged you to have your DNA tested but has little time to assist you. Attempting to communicate with Ancestry.com is like trying to communicate with an obstinate Congress. I paid $25 and couldn't even find myself, my son, or my mother. I did find my grandmother and her parents, but not my grandpa, her husband, or thier children. That and the site is very confusing and difficult to navigate. Ancestry is sometimes difficult to use, and as stated earlier, doesn't flow well. But, imagine trying to get at even a small fraction of the information "in person". Perhaps too many people expect a magic ending to their searches. Going back 5 or 6 generations can be difficult, confusion and full of wrong turn. This stuff takes time and much patience. I would give ancestry negative stars. IT's terrible. I know more than they know. If you aren't from America, there's nothing for you here. Such a waste. There is some info. But it's a crap shoot. People have to remember that the records on ancestry.com are elsewhere on other websites as well. And the truth is, the only records you can get from any website are the records that have been put into the system. Presently, that has a long way to go. A LONG way to go. Mary Phagan..... I am her great great neice please e-mail me If you are related [email protected] Thank you! Yes, it's expensive, but well worth discovering information I'd get no other way. If half of your users are dissatified with your software (as am I), you're not listening to your customers. Was a member for years, but couldn't find anything on my ancestors that I couldn't find for free somewhere else on the 'net. They use info other people have voluntarily submitted and have the nerve to charge for it and make $$! Try www.rootsweb.com--much better! I Have Tried Everything I Can To Find Out Something On My Family. NO Help Anywhere. I Cant Pay For These Sites. MY Family Name Can Anyone Help.. Is WHITEHEAD And MOSS.From ALA.-GA-TN-MS.
14 of 52 people found this review helpful. I think how much you'll like Ancestry.com depends on what you are looking for. I research the Kentucky records primarily and I LOVE Ancestry.com. It's the best money I ever spent. However, I did notice they don't have a lot on some of the other states, and I've never looked into other countries' records. That costs extra, and I agree that the "new" Ancestry.com is more difficult to use than it used to be. i lost my son michael sanders b-day 4-17-91 . when i was sent to prison . i had no one to care for him . he might have a differnt name. i believe he might have bean adopted i called him mickey. i would like to find my older brother that was given up for adoption cause i have found our other brother and we have kids to let him know who he is and the history of us his name before adoption was rocky allen kent. 53 of 92 people found this review helpful. why do you say free when it isn't? I love this site and have found lots of useful information. You may have to spend some time and effort to find what you want. It's not going to jump out in front of you without you doing some searching to find it. Learn how to perform a search for what you want. Nothing worth having in life is FREE. 17 of 45 people found this review helpful. Says it is free like the othears but it is not. 58 of 93 people found this review helpful. 32 of 72 people found this review helpful. I paid my money and got nothing in return. Beware of this site. If it is actually a free trial and I can cancel before I am billed.Why do they need a credit card! this site doesnt flow easily By the time you try to figure out where you're going, you're too tired to continue. Although I did continue, the site wasn't very helpful at all1 I was looking so forward to this only to be disappointed. 39 of 62 people found this review helpful. The new technical staff for Ancestry.com revamped its website, but in the process made it more difficult to get full census pages. When you click on an ancestor's census year to view the page, you get only 1/4 of the page. Then you have to go through a lot of time-consuming trouble to finally get a full page. Also, when you enter an ancestor's name and info for searching, you get mostly names and places that have nothing to do with your ancestor or where your ancestor lived. For instance, if your ancestor lived in New York, you end up getting a whole lot of records for European countries. Ancestry.com used to work A LOT BETTER, before the new Ancestry technical staff started messing around with the Ancestry.com website. As the old saying goes, "If it ain't broke, don't fix it." I've been an Ancestry.com user for years, but am not going to renew my subscription, because I'm frustrated and disgusted with the new changes that have actually made searching and finding the records you want more difficult and time-consuming. Oh...I did try contacting the technical people via phone, only to get a lot of answering machine messages telling me a lot of buttons to push for whatever. Ended up waiting a half hour, still no technical person. So I hung up. Lousy customer service, on top of the technical staff there ruining what used to work well, before they messed around with it. 13 of 46 people found this review helpful. I have found usful information, but I think the price for the Subscriptions are too high, since it's gotten harder to do the searches. Ancestry raised the price without any notification. Not good PR. totally useless! A waste of time. You advertise free access to info and NOTHING is free. i had to give ancestry 1 star because that was the lowest on the list ,but when something is advertised as FREE then it should be FREE!!! This is the biggest disapointment . I was all excited about trying it free and I didnot find anything I did not already know about my ancestors. my birth certificate states I was born in louisville Ky @ general hospital which is no longer there my birthday is Nov.9,1961.My adopted parents has been deceased for years. I have been trying to find my biological mother or father for years now. Im sure I have other brothers or sisters i wonder alot about it. Whether I was the oldest or younger one. Its very painful not knowing who I am or who I came from. 59 of 102 people found this review helpful. There is nothing on this sight for just $12.95. At minimum, it is $19.95 a month, and goes up from there!! $39.95 is not cheap for nothing. Don't charge unless you give something. 26 of 43 people found this review helpful. Ancestry.com is where its at get the free trial, research for 14 days free and cancel without paying a penny. I had NO idea how much stuff I was going to find. I found over 400 family members and printed off some amazing documents. Felt a little guilty that I canceled before I paid anything. 50 of 97 people found this review helpful. I was unable to find anything that i needed, This is the biggest case of false advertising i have ever seen. Anyone who is looking for your family members you will be better off going to the library where they have valid information for you to use.